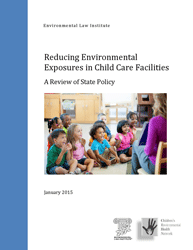 Reducing Environmental Exposures in Child Care Facilities: A Review of State Policy examines state policies across the U.S. that address environmental health in licensed child care facilities. The report focuses on several key indoor environmental exposures, including environmental tobacco smoke, radon, carbon monoxide, mold, ventilation, pesticides, lead-based paint, and asbestos. Each chapter provides an overview of state laws and regulations and highlights examples of notable programs and policies.